It’s that time of year again when men in black can be spotted at traffic intersections all over the city. 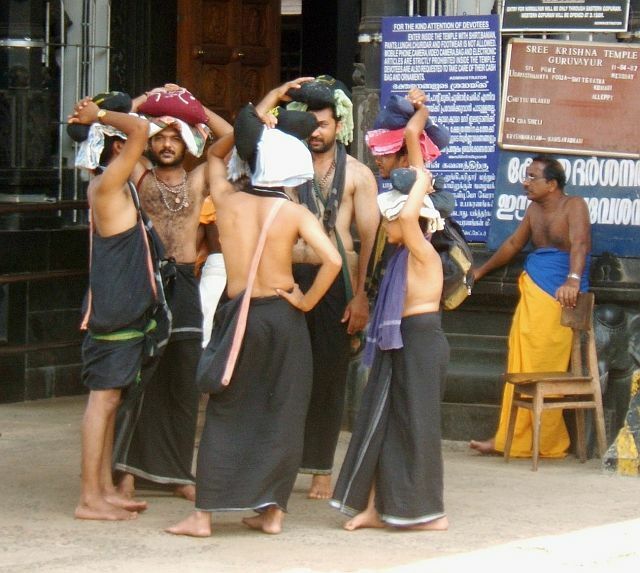 This past weekend, while waiting at a red light, one of these bearded, barefoot and black-clad men tapped on the car window and made a short speech of which I only understood two words: “Sabarimala” and “Ayyappa”. He held out something shaped like a coconut in which he was collecting donations. I’ve always been intrigued by this annual pilgrimage so I was happy to make a small contribution towards his journey to Lord Ayyappa’s abode in Sabarimala in Kerala. I have written about the Sabarimala pilgrimage before here. This is a popular pilgrimage undertaken only by men (pre-pubescent girls and post-menopausal women are also ‘allowed’ to take part). For weeks before embarking on the journey, pilgrims must (among many other things) walk barefoot, not shave or cut their hair, eat only vegetarian food, sleep without a pillow and “have no connection with wife” (this is how someone explained this to me!). My landlord told me that he would go to Sabarimala every year. But he finds the pilgrimage too strenuous now at his age. 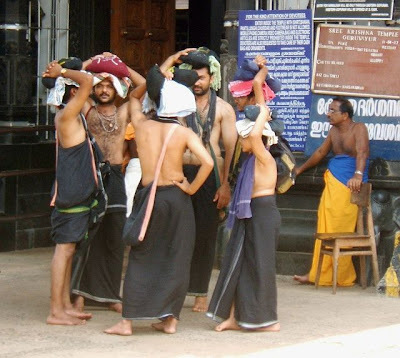 Pilgrims have to walk for a long time, barefoot, uphill, on difficult terrain. He also said that this pilgrimage has become increasingly popular in the past ten years and that it’s become difficult to negotiate the huge crowds. But today I learned that Mohammed doesn’t need to go to the mountain, the mountain can come to him. When I logged onto the website of a courier company this morning to check the status of a shipment, an interesting advertisement popped up announcing the ‘Holy Prasada Express Home Delivery Service’. 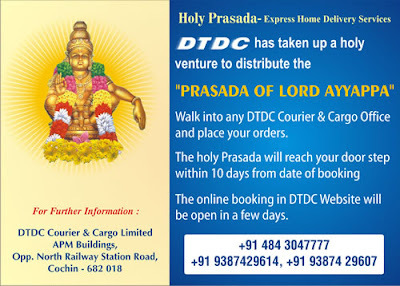 DTDC Courier and Cargo has launched a “holy venture to distribute the prasada of Lord Ayyappa.” Thanks to DTDC, there’s no need to submit to 41 days of austerity and walk for kilometres through thick forests all the way up to Sabarimala to receive Ayyappa’s blessings. Instead, you can easily pop into your neighbourhood DTDC branch and place your order for prasada (holy food blessed by the god). The company guarantees quick service: “the holy prasada will reach your door step within 10 days from date of booking.” For the more technologically-inclined, on-line booking will soon be available. - Called ‘avavana prasadam’, it’s made of rice, jaggery, sugar, raisins, cardamom, cumin, ghee and coconut. - Between 120,000 - 160,000 250ml cans are sold on average each day during the two-month pilgrimage period. - The shelf life of a can of ‘avavana prasadam’ is one year. - To make 100,000 cans, 38kg of rice, 200kg of jaggery, 3.6kg of ‘sugar candy’, 1.8kg of raisins, 0.720gm of cardamom, 0.360gm of cumin powder, 10 litres of ghee and 16 coconuts are needed. I wonder what's more explicit. The actual word of the activity or that sentence. Hehe. But seriously, that's sentence is a slang. An equivalent english sentence would be "not to stay in-touch with your wife". Hmm... There's some ambiguity in that sentence too i guess. The prasadam itself is very thick, very dark brown in colour and very strong-tasting. I can never handle more than a small spoonful; for the rest of the day, everything tastes like prasadam. 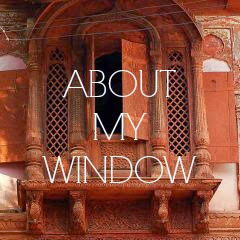 Your blog posts remind me of R.K. Narayan's short stories while I was growing up in India. I had moved to US about 13 years ago and cherish your blog a lot. 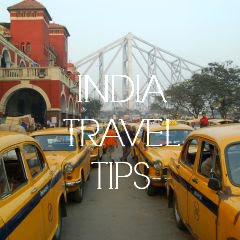 Infact, you have been an inspiration for my recent attempt at my new blog as well. Yes, it was an interesting choice of words! 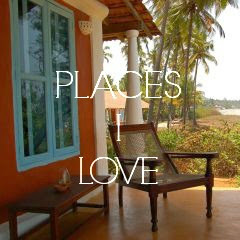 Thanks Barns for letting us know what the prasada is like... I was intrigued by the fact that it comes in a can! So I was wondering what form it takes! Many sincere thanks Habatri! I will visit your blog too.